WE SUPPORT OUR TROOPS AND COUNTRY. Aviation was my first artistic love, says William S. Phillips, but my true, enduring love remains my Christian faith, home and family. So it is my pleasure to combine all of it in my work. The historical aviation subjects, I research; the contemporary and nostalgic subjects, I live. Phillips grew up loving art but never thought he could make it his livelihood. That was all the incentive he needed to begin his work as a fine art painter. Bill Phillips is now the aviation artist of choice for many American heroes and the nostalgic landscape artist of choice for many collectors. Bills strengths as a landscape painter are what gave him an edge in the aviation field: respect and reverence for a time and place. When one sees his aviation pieces, thoughts are about the courageous individuals who risked their lives for our freedom. In Bills nostalgic works, the viewer understands fully what that freedom is... The precious values that make life worth living. After one of his paintings was presented to King Hussein of Jordan, Phillips was commissioned by the Royal Jordanian Air Force. He developed sixteen major paintings, many of which now hang in the Royal Jordanian Air Force Museum in Amman. The Smithsonian Institutions National Air and Space Museum presented a one-man show of Phillips work in 1986; he is one of only a few artists to have been so honored. In 1988, Phillips was chosen to be a U. For his outstanding work, the artist was awarded the Navys Meritorious Public Service Award and the Air Force Sergeants Associations Americanism Medal. In 1991, three of Phillips works were chosen as part of the top 100 in Art for the Parks, the prestigious annual fund-raiser for the National Park Service, and one painting received the Art History Award from the National Park Foundation. Phillips Limited Edition Fine Art Giclee Print. Where is the nearest carrier? Is often the first question from a President when a crisis erupts overseas. A powerful instrument of diplomacy and military might, the Navys carrier battle group has been the United States reaction-force-of-choice since World War II. Collectors, naval and aviation enthusiasts all react in a similar fashion when William S. Phillips turns his painters eye on these seagoing airfields. An aircraft carrier is exciting beyond belief, beams Phillips. Its the tip of the spear and it operates that way. Its dangerous and its exciting. The sense of mission and camaraderie from the engine room to the flight crews is inspiring. For the rest of my life, Ill jump at the chance to get on one whenever I can. In the late 1970s, I had the chance to deploy on the USS Kitty Hawk (CV 63) out of San Diego, but this scene could be anywhere in the world because sunsets are universal at sea. Coming on board a carrier is tough no matter what time of day it is. They call flight operations at this time Pink Ops. Technically, it is a night operations, but Ill tell you, landing in any kind of daylight beats coming aboard before absolute dark. The CAP aircraft, both coming in and going out, are early versions of the F-14. There is a Fine Art Edition of Sunset Recovery for every type of collector. There is a special and very limited over-sized 37" x 28" MasterWork Giclée Canvas edition of only 25 pieces. A more moderately sized yet beautiful 28" x 21" Fine Art Giclée Canvas and a traditional Fine Art Giclée Paper at 24" x 18" are also available. Dont miss out on your opportunity to own one of William S. Phillips much admired aircraft carrier editions. 24" by 18", Edition size 200, signed by the artist. All Limited Edition prints are signed and numbered (S/N) by the artist. Limited Edition prints are restricted to a certain number. For example, if 400 prints are made from an original painting, once theyre gone, thats it. There is no limit to the number of open edition prints of a particular painting. Thats why Limited Edition prints are more expensive and more valuable to collectors than "open" edition. Rare objects are more valuable. The term "giclee" denotes an elevation in printmaking technology. Images are generated from high resolution digital scans and printed with archival quality inks onto various substrates including canvas, fine art, and photo-base paper. The giclee printing process provides better color accuracy than other means of reproduction. The quality of the giclee print rivals traditional silver-halide and gelatin printing processes and is commonly found in museums, art galleries, and photographic galleries. All Limited Edition artwork is subject to availability at time of order. 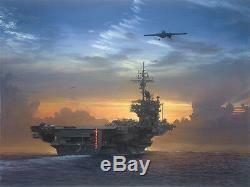 The item "Sunset Recovery William S.
Phillips USS Kitty Hawk Limited Edition Print" is in sale since Wednesday, March 21, 2012. This item is in the category "Art\Art Prints". The seller is "airplanesandmore" and is located in Flower Mound, Texas. This item can be shipped to United States, Canada, United Kingdom, Denmark, Romania, Slovakia, Bulgaria, Czech republic, Finland, Hungary, Latvia, Lithuania, Malta, Estonia, Australia, Greece, Portugal, Cyprus, Slovenia, Japan, Sweden, South Korea, Indonesia, Taiwan, South africa, Thailand, Belgium, France, Hong Kong, Ireland, Netherlands, Poland, Spain, Italy, Germany, Austria, Bahamas, Israel, Mexico, New Zealand, Philippines, Singapore, Norway, Saudi arabia, Ukraine, United arab emirates, Qatar, Kuwait, Bahrain, Croatia, Malaysia, Chile, Colombia, Costa rica, Dominican republic, Panama, Trinidad and tobago, Guatemala, El salvador, Honduras, Jamaica, Antigua and barbuda, Aruba, Belize, Dominica, Grenada, Saint kitts and nevis, Saint lucia, Montserrat, Turks and caicos islands, Barbados, Bangladesh, Bermuda, Brunei darussalam, Bolivia, Ecuador, Egypt, French guiana, Guernsey, Gibraltar, Guadeloupe, Iceland, Jersey, Jordan, Cambodia, Cayman islands, Liechtenstein, Sri lanka, Luxembourg, Monaco, Macao, Martinique, Maldives, Nicaragua, Oman, Peru, Pakistan, Paraguay, Reunion, Viet nam, Uruguay.